LANSING, Mich. — Senator Adam Hollier (D–Detroit) took the oath of office today to serve the constituents of Michigan’s 2nd Senate District. A proud graduate of Detroit Public Schools, Sen. Hollier received his bachelor’s degree in industrial labor and relations from Cornell University and his master’s degree in urban planning from the University of Michigan at Ann Arbor. He began his career of public service as a volunteer firefighter before enlisting in the U.S. Army and working for elected officials in Detroit. A Democrat, Sen. Hollier represents citizens of the 2nd District in Wayne County that includes the cities of Detroit, Grosse Pointe, Grosse Pointe Farms, Grosse Pointe Park, Grosse Pointe Woods, Hamtramck, Harper Woods and Highland Park, and the Village of Grosse Pointe Shores. 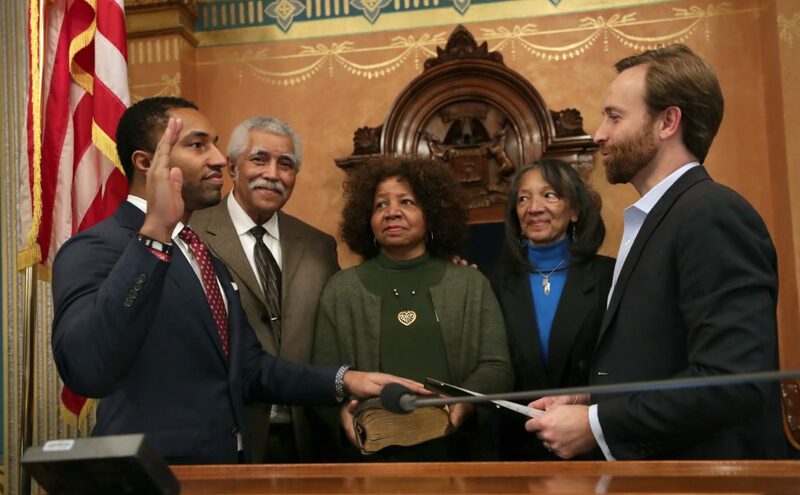 Sen. Adam Hollier (D–Detroit) took the oath of office today at the Senate rostrum in the Capitol Building, with his parents and aunt by his side.